I bought affordable tickets to every author appearance I could attend, from events at Oxford Literary Festival to signings in Blackwell’s, falling evermore in love with my new town and the endless opportunities it offered. Who haven’t I seen and heard here? From Anita Shreve to Phillip Pullman, and catching Misha Glenny, author of McMafia in Blackwell’s, the book that inspired the gripping British television drama felt almost surreal. Awed by encounters like these and already living in a writers’ paradise, I decided it was time for me to resume writing myself – in sheer self-defence! In the past I had studied for an MFA in Creatine Writing from Columbia University in New York, which had led to my work on The Writer’s New York Source Book and Under the Influence, a highly rated TV drama. How better to reawaken my literary ambitions than through a writing course through Oxford University’s Continuing Education? The inspiration gained from this course, with its invigorating exercises and incisive critiques, was invaluable. 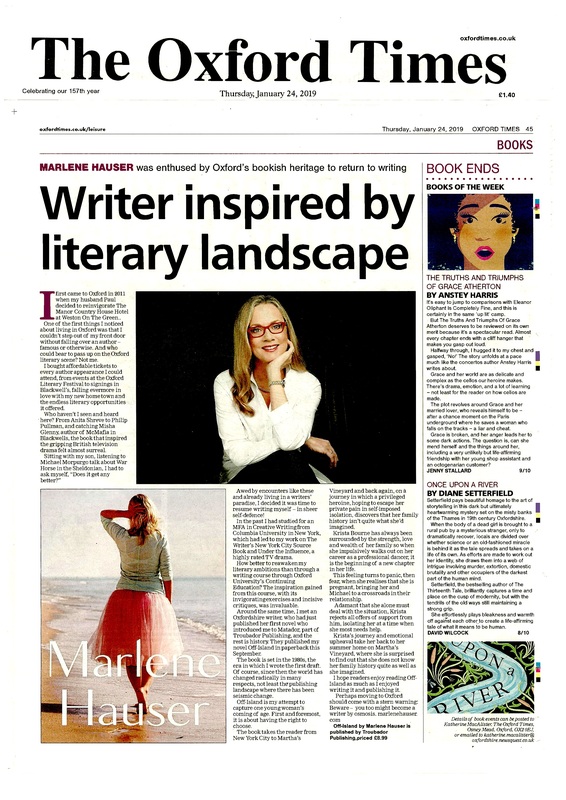 Around the same time, I met an Oxfordshire writer, who had just published her first novel who introduced me to Matador, part of Troubador Publishing, and the rest is history. They published my first novel in paperback this September. The book is set in the 1980’s, the era in which I wrote the first draft. Of course, since then the world has changed radically in many respects, not least the publishing landscape where there has been seismic change. Off-Island is my attempt to capture one young woman’s coming of age. First and foremost, it is about having the right to choose. The book takes the reader from New York City to Martha’s Vineyard and back again, on a journey in which a privileged heroine, hoping to escape her private pain in self-imposed isolation, discovers that her family history isn’t quite what she’d imagined. Krista Bourne has always been surrounded by the strength, love and wealth of her family so when she impulsively walks out on her career as a professional dancer, it is the beginning of a new chapter in her life. The feeling turns to panic, then fear when she realises that she is pregnant, bringing her and Michael to a cross roads in their relationship. Adamant that she alone must deal with the situation, Krista rejects all offers of support from him, isolating her at a time when she most needs help. Krista’s journey and emotional upheaval take her back to her summer home on Martha’s Vineyard, where she is surprised to find out she does not know her family history quite as well as she imagined. I hope readers enjoy reading Off-Island as much as I enjoyed writing it and publishing it. Perhaps moving to Oxford should have come with a warning: Beware – you too might become a writer by osmosis.